We’ve been told not to judge a book by its cover, but what about its photography, layout, typefaces, paper—and how they all interact with each other? 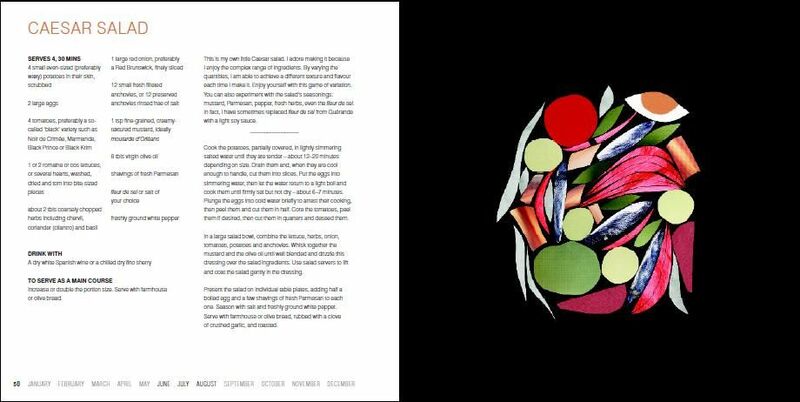 Each week, we’ll be sharing a book spread that’s worth taking a close look at for one reason or another. And we’ll ask you: What do you think about it? Today: Is it art? Is it a recipe? There are cookbooks that don't have a photo of food on the cover—three of this year’s Piglet competitors, for instance: A Boat, a Whale & a Walrus; Prune; and Lunch at the Shop. 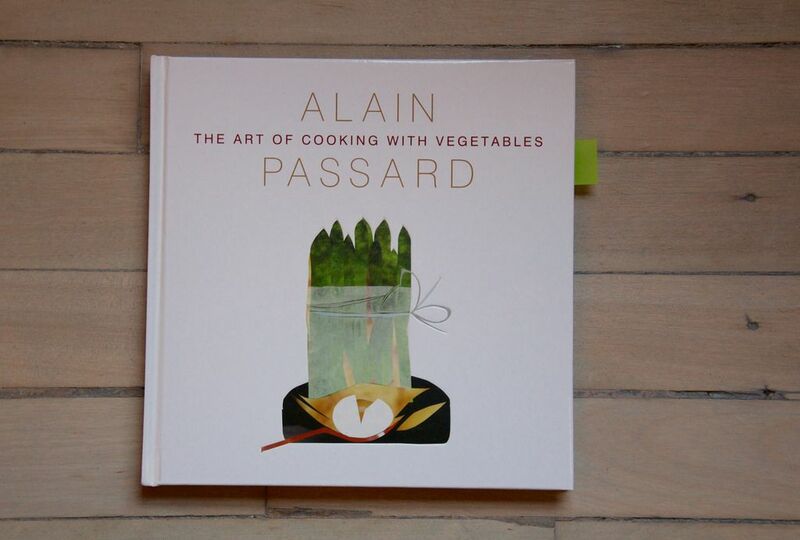 The collage on the cover of Alain Passard’s The Art of Cooking with Vegetables—a collage of food, if not a photograph—made me wonder if there were photos waiting for me inside that would provide instructions for arranging asparagus in such an upright manner (or maybe only Chef Passard and Vogue store asparagus this way). Yet the pages include more, shall we say, unrealistic illustrations—things I have never seen in a cookbook or in my fridge or on my table. The collages, which Passard created himself, didn’t exactly make me want to cook the recipes—or anything, really. But I liked looking at them. Take the one accompanying the Caesar Salad recipe (above): I tried to decide what it was and landed on a hodgepodge of rhubarb, green grapes, mozzarella, sardines, and hard-boiled eggs. It was a fun exercise, one I’ve never had to do in a cookbook. And it was a welcome change of pace: We already know what a Caesar Salad looks like, so why not include an abstract collage that maybe doesn’t look like the recipe? Maybe if the book is meant to be an object—an art piece—and not necessarily a guide in the kitchen. More: Another ostensibly esoteric cookbook that wants readers to focus on the food. But here, it’s clear Passard’s intention isn’t to leave us alone with his artistry—he does want us to cook. He’s giving us a lot of text elements to go forth, more than what we might find in rigorous cookbooks: In addition to the expected ingredients list, methods, headnote, and serving size, there’s the cooking time, drink pairings, variations to beef up the recipe, and the months in which it should ideally be made. What more would you want or need from a recipe? My new answer: a collage. Tell us: Does the collage make you want to cook the recipe? Or do you cling to images? Thanks to Kitchen Arts & Letters for letting us raid your store and borrow this book.